Your vacation home is a newly generous thatched cottage. It is furnished in modern style with holiday pleasure-sprayed details lovingly under the motto: sun, sand & sea. A generous lovingly furnished living room with comfortable sofas and a homey fireplace and an open kitchen with cooking island and counters, dining table for 6 people you expect, two bathrooms, two double bedrooms with double bed and another with bunk beds can accommodate the entire family. 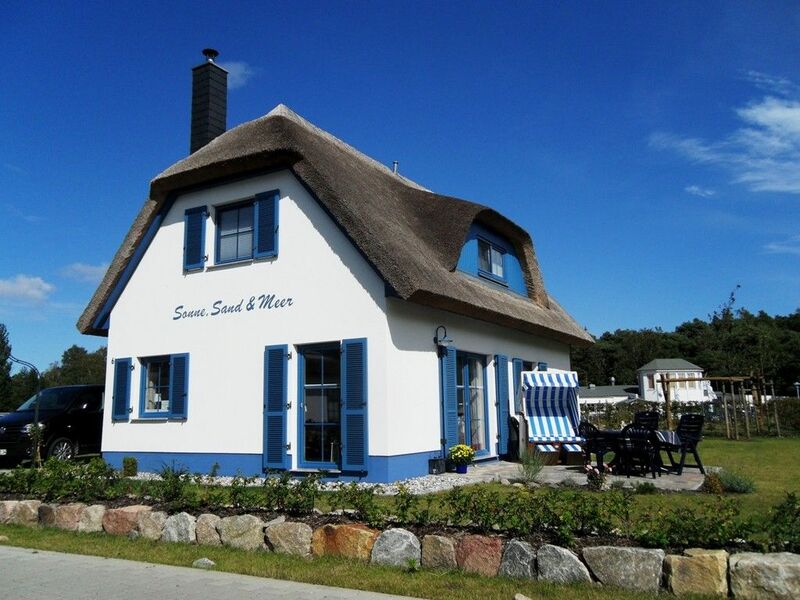 Enjoy in particular in the low season the beauty of the island of Ruegen and come to your beach walks or exploring 'home' in your romantic and cozy thatched house, you can enjoy rest and relaxation, the crackling fire. During Advent, the house is decorated for Christmas, we invite you: Advent at the sea! a cozy sofa area and a homely fireplace. A 42 'LCD TV and a CD-DVD-stereo system provide entertainment. Wifi is included. Also located on the ground floor a bathroom with shower / toilet as well as our 'children' in the Marine style with bunk beds. Upstairs invite two bedrooms, one maritime blue as the sea, overlooking the Breeger Bodden and the other sun yellow, with sunrise guarantee for a relaxing and recovering. Both bedrooms are furnished with a double bed 1,80 x2 m, wardrobe and drawers. On the upper floor further a large bathroom is with shower / wc. The entire house is heated by geothermal energy and is equipped in all rooms with underfloor heating. The garden - lovingly created and well maintained - is lined with traditional local potato roses, pink flowering in summer, in Hebst with rosehips jewelry. The terrace - all day sun trap - is equipped with garden furniture for 6 people. As a highlight, you will find a beach chair to relax. Directly on the property are 2 parking spaces available. For your brought or rented bikes or a stroller course is in a locked shed. Whether swimming or active holiday, whether summer or winter. Only a short walk through a nature protected pine forest, and you have a unique view of the longest natural bay on the island. The sandy wide beach, the typical beach chairs and clean shallow sloping water invite young and old to relax, relax, play and swim - or early in the morning for a round of jogging or walking along the Baltic Sea? Recovery in comfort and convenience: The house 'Sun, Sand & Sea' enjoys a unique and prime location. It is beautifully located on Breeger Bodden in a quiet cottage area. Whether you watch after a long beach or discovery day on the terrace with a glass of wine the sunset over the Breeger Bodden or cuddling sitting for a walk through the colorful autumn woods or along the frozen Baltic Sea in winter before the crackling fireplace - you are in our house always find rest and forget about everyday life. The open, light-filled, modern, high quality and comfortable living area, makes the fireplace and tasteful decoration for comfort and spa-holiday mood. Likewise, the bedrooms invite me to their cozy and comfortable means for switching off from everyday life. In the Advent and Christmas time, our house is decorated for Christmas - we invite you to cozy Advent or Christmas days at sea. Families are welcome: Our holiday house holds in particular for families big plans. Our bunk bed is a holiday highlight for your children. For the youngest is a cot and baby monitor available. Also high chair and step stool is available. In the kitchen equipment we have also thought of the youngest. So Plastikschüsselchen, cups and even a children's cutlery. And even if times should be bad weather: children's books, building blocks and toys for children and adults reading and games will keep boredom at bay. In the holiday home area is available a nice playground for use. Both bathrooms guarantee a good start to the day. They are bright and lovingly and tastefully fitted. The spacious, light-filled living area with open kitchen is comfortable and cozy furnishings with great attention to detail. A cozy sofa area invites you to relax. The 42 'TV provides cable TV for entertainment, as well as the CD-DVD system. The kitchen is fully equipped. Bed linen and towel sets are included. Toilet paper and dishwasher tablets and a basic set of detergents are provided. The house is suitable for allergy sufferers. Pets are not allowed. In Breege-July are sufficient shops (bakers, grocery store, souvenir, books) as well as bike rental, ATM and physician present in Glowe (8km) and old churches (2km) are the nearest supermarkets, pharmacy and petrol station. Recommended restaurants and cafes can be found in Breege sufficiently. You can actually say that you can dine very tasty and also inexpensive on the island everywhere. Es war ein wundervoller Urlaub in einem sehr,sehr schönen Haus. Wir haben uns dort mehr als wohlgefühlt und werden mit Sicherheit wiederkommen. Das Haus bot alle Annehmlichkeiten, die wir uns so wünschten.Der Eigentümer erfüllte jeden kleinen Sonderwunsch und der Betreuer des Objektes war super. Es stimmte einfach alles. Vielen Dank für diese tolle Bewertung, wir freuen uns sehr, dass wir mit unseren Bemühungen und vor allem unserem Ferienhaus Ihre Wünsche im Urlaub erfüllt haben und freuen uns, wenn auch Sie wieder Ihren Urlaub bei uns verbringen werden, denn unsere Stammgäste sind uns das größte Lob. Hervorragendes Ferienhaus, auf das die angegebene Beschreibung bis ins Detail passt. Besonders genial war der große Garten, die schöne Terrasse, die Aussicht zum Bodden und die Nähe zum Meer. Die Einrichtung lässt keine Wünsche offen. Die Kommunikation mit den Vermietern war äußerst unkompliziert und schnell. Äußerst empfehlenswert! Vielen Dank für diese tolle Bewertung. Es freut uns sehr, dass wir mit unserem Ferienhaus und unseren unkomplizierten Buchungsmodalitäten unseren Gästen den Urlaub besonders machen können. Ein sehr schön gelegenes und vollständig, liebevoll ausgestattetes Haus, das keine Wünsche offen lässt. Wir waren mit unseren Enkelkindern hier, die haben sich von Anfang an sehr wohl gefühlt. Die Großzügigkeit, der schöne Außenbereich und die Strandnähe haben allen gefallen. Einkaufsmöglichkeiten, eine Vielzahl von Restaurants in der unmittelbaren Nachbarschaft und kindgerechte Freizeitmöglichkeiten , rundeten diesen Urlaub für uns ab. Wir werden gerne wiederkommen. super ruhig und sehr Strandnah gelegen der führt durch ein Kieferwäldchen und enthüllt nach ein paar Schritten die schöne Ostsee mit seine wunderschöne 8 km langen Strand. Mit eine Satz gesagt, es ist alles da was man für einen Urlaub braucht. Das Haus verfügt selbst übere eine geschmacksvolle Einrichtung mit leibe zum Detail und der Strankorb im Garten lädt direkt ein zum faulenzen. Danke an den sehr netten Vermieter und den freundlichen Kontakt. Vielen Dank für die tolle Bewertung. Wir freuen uns, dass Sie Ihren Urlaub hier in allen Zügen genießen konnten und sich hier rundum wohl gefühlt haben. So soll es sein - das ist unser Wunsch, schließlich haben Sie sich Ihren Urlaub verdient. Bis zum nächsten mal, Ihre Familie Wolter. Ist ein total hübsches, modernes Ferienhäuschen mit alles Extras die man so gern hätte. Wir waren sehr zufrieden und haben uns sehr wohl gefühlt!!!! Die Lage ist auch perfekt, der Strand ist nicht weit, Einkaufsmöglichkeiten in der Nähe und in Breege am Hafen ein Top Fischlokal!! Das freut uns sehr und wir bedanken uns für das Lob zu unserem Häuschen. Schön, dass Sie sich so wohl gefühlt haben und auch wir schätzen immer diese tolle ruhige Lage, ruhig und doch zentral zu allem was man braucht und sucht. Einen schönen Sommer wünscht Familie Wolter. Sun, Sand & Sea - an unforgettable dream holiday on Germany's largest island. Your cottage is idyllically situated on the edge of a pine forest between the Breeger Bodden and the sandy beach on the Baltic. Rügen is Germany's island with the most sunshine hours. From the house and the south-facing terrace you have direct water views. The port of Breege you can walk and from there onwards interesting boat trips or sailing trips. The longest and most beautiful beach on the island of Rügen is just 350m. The gorgeous sandy beach, with its gently sloping water especially families relaxing hours. Your holiday home is an ideal starting point for many popular destinations such as the Rügen Kap Arkona, the chalk cliffs with the King chair or the island Hiddensee. Rügen can be well explored by bike because of the well-developed network of trails and thereby experience the unique and charming nature and discover. Die angegebenen Preise sind INKLUSIVE sämtlicher Kosten, wie - Internet-Wlan - Heizung - Strom - Wasser - Müllabfuhr - Endreinigung - Geschirrspültabs, Müllbeutel, Grundausstattung an Reinigungsmitteln, Seife, Erstausstattung Toilettenpapier Ebenso ist das Aufstellen des Kinderbettchens und Hochstuhls INKLUSIVE. Die Preise gelten für eine Belegung bis 4 Personen, 5.und 6. Person gegen geringen Aufpreis von 12€ pro Person/Tag.. Bettwäsche und/oder Handtücher können gegen eine geringe Gebühr von 10€/Set Bettwäsche bzw. Handtücher vor Ort hinzugebucht werden. Die ortsübliche Kurtaxe ist vor Ort zu entrichten (altersabhängig nach Saison). In der Hauptsaison vermieten wir nur wochenweise ab Samstag bzw. Sonntag nach Verfügbarkeit. Abweichungen im Mindestaufenthalt und Anreisetag sind nach Absprache und Verfügbarkeit möglich.